Имате въпрос към Travelbee Heritage Inn? Удобно проектиран като за бизнесмени така и за почиващи туристи, Travelbee Heritage Inn е идеално разположен в Дапитан - една от най-посещаваните части на града. Центърът на града е на около 0.9 km, а до летището може да се стигне до 15 минути. С удобното си местоположение хотелът предлага лесен достъп до всички градски забележителности, които задължително трябва да се видят. Съоръженията и услугите предлагани в Travelbee Heritage Inn гарантират Вашия приятен престой. 24-часова рецепция, Wi-Fi връзка в общите части, паркинг, летищен трансфер, ресторант са само част от нещата, които отличават Travelbee Heritage Inn от останалите хотели в града. Влизайки в една от 30 уютни стаи, ще забравите за ежедневния стрес с помощта на удобства и съоръжения като телевизор с плосък екран, достъп до интернет (безжичен), стаи за непушачи, климатик, бюро в някои от тях. Освен това в хотела можете да се възползвате от множество предложения за приятно прекарване на свободното време. Travelbee Heritage Inn е най-подходящото място за Вас, ако търсите качествен хотел в Дапитан. If you want to visit Dapitan but on a tight budget, I highly recommend Travelbee Heritage Inn. They're location is very accessible, it is near the Plaza and Gloria's Fantasyland. They have clean rooms, spacious lounge, etc. cozy reception area and very friendly staff, at he lobby, enjoy free coffee while browsing WIFI and my son playing their piano and guitar, a small library with variety of books to read and Bogavenia flower blooming and spreading by the windows. 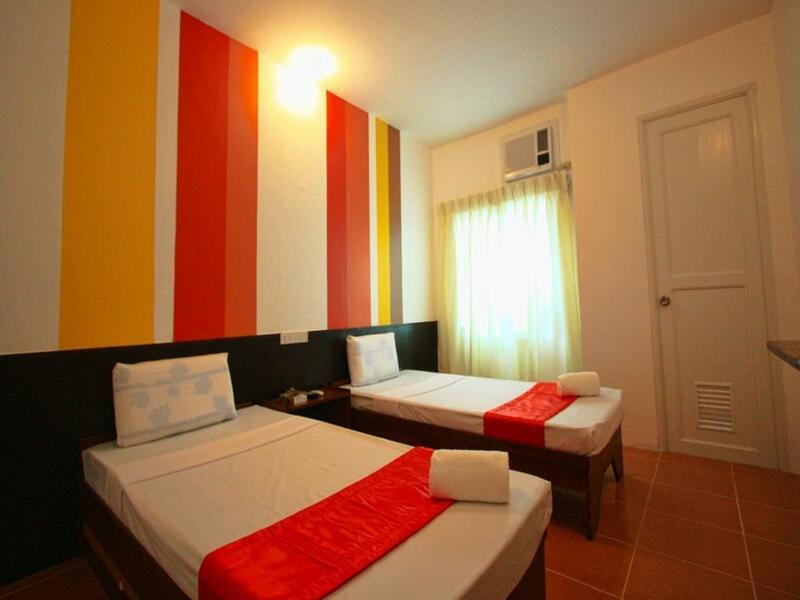 The room is spacious for 2, clean and nice colorful tile, bed and clean shower room with hot water. I rate it the best for price, cleanness, comfortably and relaxing. The place is not really that accessible to Fantasyland or even to Dakak! But if you’re looking for an affordable and yet worth it especially when it comes to cleanliness and courteus staff then this place deserved a thumbs up! Value for money is good,the place is clean and wise enough for traveler ,close to touristic place. Prolly the cleanest inn we've ever stayed. Everything looks brand new, even though the concept of the inn is more of the Dapitan heritage. The place is near the plaza. They also have bikes for rent for only Php50 a day. The staffs were courteous, approachable and VERY accommodating. They even let us check in an hour earlier without additional charge. Would probably book again in the future! place was really cozy and close to all attractions. We had a very nice stay at Travelbee. Definitely I would highly recommend it to everyone whose planning to visit Dapitan. You get way more than what you pay for. very nice and clean hotel ,rooms are nice and the cr and shower are very nice , there is also a nice terras the hotel restaurant and bar are good there is free coffee the only minus there is no cook to prepare a meal . well, ive stayed here from time to time. I specially love the veranda lounge but somehow during my long stay, the doors have always been closed. On the other hand, the decors of this heritage place are always tasteful. Room for improvement on the bed linen. The luxury room is in fact 2 rooms made to 1. Very simple, but clean, quiet and a rather good location in Dapitan. Very relax and pleasant stay. Good cheap simple breakfast, free coffee. Reasonable priced transportation service to bus-, boat-, and Dakuk Beach. Friendly staff. All in all a pleasant stay in a pleasant city. We would stay here again. Spacious, affordable and very relaxing..
Im having wonderful time staying here because its very quite, just within the city, accessible to every mode of transportations and easy on the budget..if you're looking for a nice stay, stay at travelbee, you'll definitely love it..
i like the place. i like that they preserve a heritage house. value for money. nothing spectacular. Stayed here for 4 days and 3 nights, I have nothing to complain except for their AC and WiFi. The room was average with twin beds though the mattress wasn't that foamy but it's ok for the price you paid. The room is equipped with hot and cold shower though the there was a problem with the water being retained on the floor making it flood. Cable TV and very cool airconditioner. They serve breakfast for only 70 pesos. Location is convenient, it is just one ride to the cathedral and downtown proper. Or if you are adventurous enough a 10 to 15 minutes walk you can reach Gloria de Dapitan and it's boulevard. What I like about this hotel is that it is very affordable and has a terrace at the 2nd floor where you can play "sungka" or you can just lounge with the rocking chairs around. Amongst the inns and hotels i've been, Travelbee is the cleanest inn i've been. Staff is accommodating and they promote tourism by knowing the routes and others abt Dapitan's tourist attractions. I will definitely recommend this to my friends and relatives. We went to Dapitan for short vacation of 3 days and 2 nights. I checked the agoda bookings and I can't believe that this Inn is offering a very cheap price. I have read the reviews and decided to book online. When we arrived ay 3pm the staff at the front desk welcomed us with a warm smile, I just filled up a form and we're ready to go! I booked a standard room with twin bed, the room was nice, cozy and a very good choice for us. At breakfast they offer silog meals with very affordable price and they give free coffee with bread and butter! The inn is near the plaza, saint james church and mercado so it is not a problem when you need to buy something, Gloria de Dapitan is just about 1km away with 8php fare rate in tricycle. I could say that I recommend this inn if you are looking for accomodation to tour the city. Definitely will book again whenever I go back to Dapitan City!